Cataract is an ailment in which the natural lens of the eye becomes cloudy, usually due to natural aging processes. The lens loses clarity, and patients experience a gradual loss of vision. Laser cataract surgery is a very minimally invasive procedure in which the affected lens of the eye is removed and substituted with an intraocular lens or IOL implant. The IOL mimics the functions of the natural lens and restores a patient's vision. One of the most essential steps in cataract surgery is the removal of the natural lens. The most common technique by which the lens is removed is called phacoemulsification. Phacoemulsification is a procedure in which the natural lens in cataract surgery is removed by breaking it into small fragments using an ultrasonic device. In phacoemulsification, only the lens and the front portion fibers that hold the lens, called the lens capsule are removed. This step is done after the laser cataract surgery creates incisions and softens the cataract to make it easier to remove. The procedure starts with the surgeon making a small incision at the side of the clear egion of the eye called the cornea. Once the incision has been made, the surgeon injects fluid through the incision in order to protect the tissues in the eye from shock. The size of the incision varies according to the nature of the cataract. If the cataract is highly dense, then surgeons may have to make a larger incision. These incisions are a cause for concern because larger the incision, more is the recovery time and higher are the chances of post-operative infection. removes the front portion of the lens. The posterior part is required to support the IOL implant. 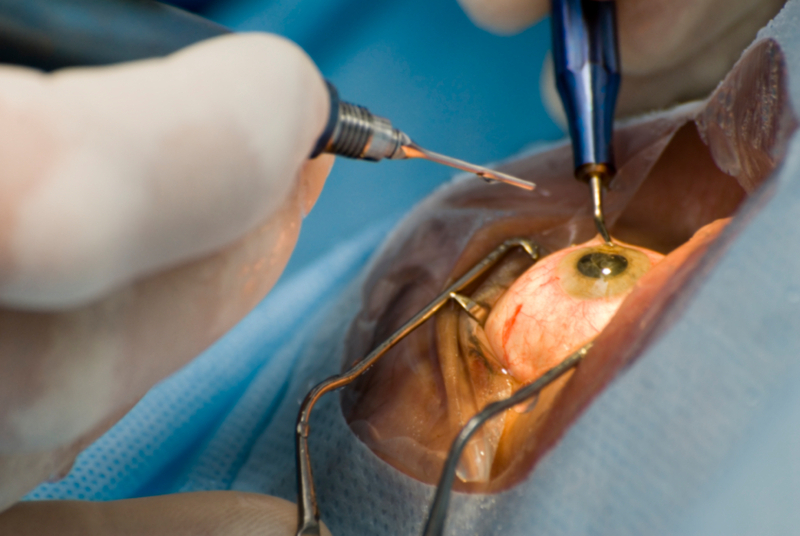 The cataract removal process is immediately followed by the IOL implantation. The IOLs are folded so that it can be implanted easily. The folded IOL is placed in the lens capsule using an injector. After positioning the IOL, it is unfolded very slowly and carefully.